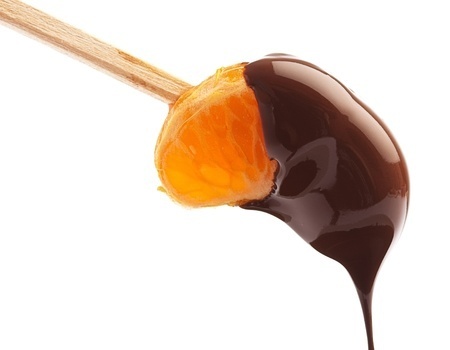 Who hasn’t tried one of those chocolate orange candies? The kind you hit on a hard surface and the “slices” beak apart so you can savor each piece. You probably loved them as a kid and chances are you allow yourself to indulge now. But what makes these two flavors work so well together? The sweet, rich flavor of chocolate mixed with the tangy citrus might seem to be a poorly paired combination. However, once you’ve tried them together you realize that their contrast works well together. Some people may say it’s the deep rich flavors and others argue it’s their tantalizing aroma, but most agree on their paired decadence. One interesting note is that both cocoa beans and oranges typically only come from tropical climates. The sugary, rich sweetness of chocolate can come in many flavors, depending on the amount of cocoa liquor. The more cocoa liquor, the more bitter it will be. Milk chocolate and white chocolate don’t contain more than 10% cocoa liquor and the flavors come from the sweet cocoa butter, sugar, crème and spices. White chocolate also has a hint of vanilla, which gives the familiar flavor of the chocolate just a little twist. While oranges have a very distinct citrus flavor, many times it’s the aroma of the orange that most associate with. If you’ve ever visited an orange grove, you’ll have a better understanding of what I’m talking about. But you can’t mistake the flavor of biting into a fresh, juicy orange. Now keep in mind that most orange flavors in today’s day and age are fabricated, even down to the oranges themselves. Orange flavor may have been recreated and processed, but we all know the distinct flavor and the smell. There was an Oxford University study done where hot chocolate was placed in four different colored cups: white, crème, red and orange. 57 participants drank the frothy cocoa beverage and the majority said the hot chocolate tasted better in the orange cup, even though it was the exact same type of hot chocolate. Our new chocolate orange black tea promises the rich flavor of chocolate and black tea with a hint of citrus and a rich aroma of oranges and chocolate crème. With real shavings of white chocolate and actual slices of dried oranges, mixed with some of our finest black tea, there’s nothing artificial about the ingredients in our tea. Take a minute to sit back and indulge yourself in three of the best ingredients nature has to offer: chocolate orange and black tea. At Inspired Leaf Teas we are always looking to create unique blends with amazing flavor combinations and our new white chocolate orange stands up well to our standard of high quality ingredients and amazing flavor. You will delight in the aroma and creamy mouth feel of this new addition to our line. Enjoy as is or with milk and honey for an extra special treat.